Predators The Galapagos hawk, short-eared owl, snakes and introduced cats. Similar to many rodents, the Galapagos rice rat is most active after dark and usually positions its burrow in the hollow trunks of cacti or underneath rocks. 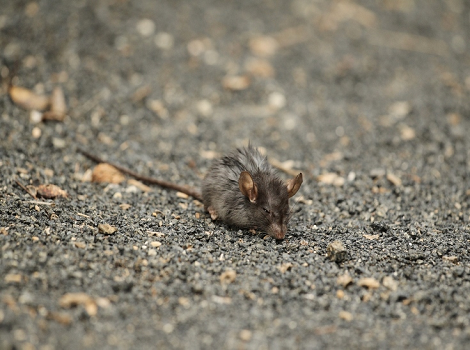 The rat is thought to prefer a desert-type habitat with cacti, small trees and shrubs, and is one of very few types of rat that is native to Galapagos and was not introduced. These endemic rats are slowly decreasing in number due to the introduction of other rats such as the black rat and a sub species of this type of rat has already become extinct on San Cristobal.